The Robinson Middle School Bands (grades 7 - 8) are organized into four band classes with more than 200 students participating. The classes are Ram Band, Cadet Band, Concert Band and Symphonic Band. Students also have the opportunity to participate in an after school jazz ensemble. Rounding out the middle school music department are three middle school orchestras, a mixed choir, girls’ choir, men's choir, and 8th grade semester music lab class. Both the administration and guidance departments strongly support the music program at Robinson. The master schedule allows for middle school teams and mixed performing groups for grades 7 and 8. Each band meets on a rotating A/B block schedule with sectionals both during class and after school. Many students in the Symphonic Band study privately with professional musicians from throughout the Washington D.C. area. The middle school bands present three concerts a year, participate in District XI Junior Band and District XI Band Assessment, Solo and Ensemble Festival, and a spring adjudication. The Symphonic Band has consistently received superior rating in Grade IV literature at District Festival and always places a large number of students in the Junior District Band each year. Students from all levels of band are encouraged to participate in the Solo and Ensemble Festival in the Spring. A "Sudler Silver Cup" band, the highest honor bestowed on middle school bands,the Robinson Middle School Symphonic Band has been recognized on the local, regional, state, and national level for its outstanding performances. These include performances at the 1992, 1993, and 2000 Virginia Music Educator Association Conference, first place and judges choice awards at every spring festival, and a performance at the 1993 and 2000 Midwest International Band and Orchestra Clinic. In 1997 Ms. Linda Gammon and the Robinson Bands were awarded the prestigious John Philip Sousa Foundation Sudler Silver Cup. In the spring of 2003, the band will premier a new band work composed and dedicated to Robinson Band by David Shaffer. 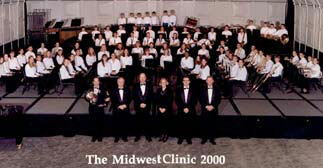 In December 2000, 81 seventh and eighth graders of the Middle School Symphonic Band were invited to perform at the Midwest International Band and Orchestra Clinic in Chicago. The band along with directors, guest soloist Senior Chief Musician Roger Behrend, and parent chaperones traveled by air to the Windy City the week before Christmas. The 45-minute performance for which the students began rehearsing before school started in August, included ten selections and three guest conductors: David Shaffer also the composer of the music he conducted, Stanley R. Schoonover, Music Specialist, Fairfax County Public Schools, and Curvin G. Farnham, Director of Bands, University of Maine. The trip included meeting other composers of music the students performed, an evening at Disney Quest, time to roam the vast exhibit hall full of instruments and everything musical, and a visit to Chicago's Field Museum. 4. Check your name/address/phone #. Make any changes necessary. 5. Enter your personal email address in the space provided. 6. Click on “Adult’s Information” tab at bottom of screen. a. Enter information for parent 1 if applicable. b. Enter information for parent 2 if applicable. 7. Click the green “UPDATE” button in upper right hand corner to save your info.